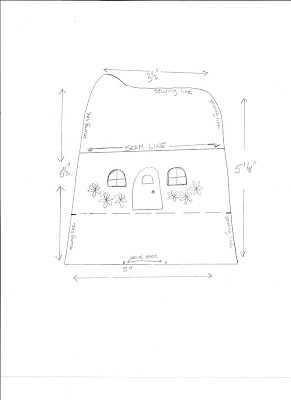 I cut a strip of fabric for the roof about 4" X 11" and a strip of fabric for the body of the house 4.5" X 11"
The drawn line will be your sewing line....NOT THE CUTTING LINE....reduce your stitch length and stitch on the drawn line leaving the entire bottom open for now. The bottom is open so I had easy access to add a door, windows and flowers - placing them where I wanted....it is your happy house!!! 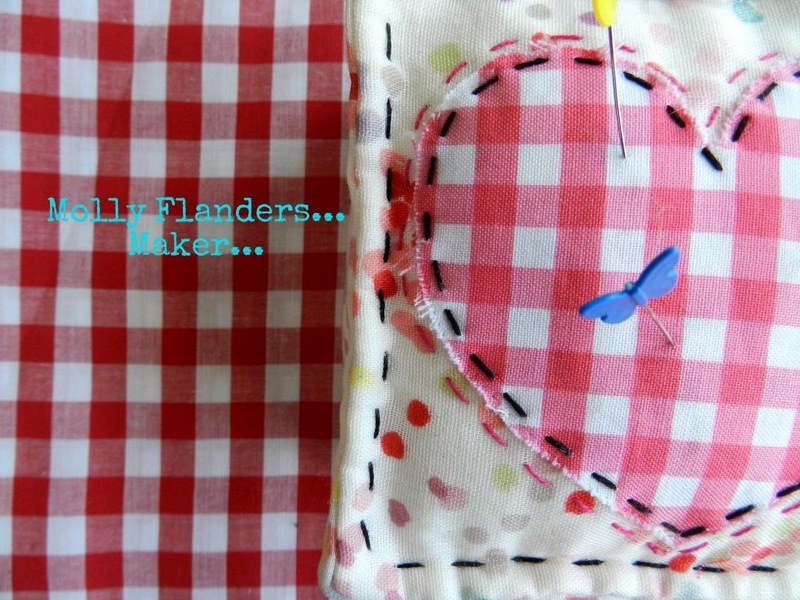 If you notice on the pattern I have a dotted line just below the door running across the width of the house....be aware of this line while adding your embellishments...this line will be the bottom of the pincushion. Turn the pincushion inside out again so the wrong side is on the outside....with your sewing machine stitches still reduced, stitch from the opening space to the side you previously stitched and then stitch the other side of the opening space to the side of the house where you previously stitched....now you should just have the opening space open....Are You Still With Me? Then gently turn the cottage right side out and stuff firm....slip stitch the opening closed....and there you have it! A cute little pincushion cottage!!! And here is a happy cottage using felt for the flowers!!! What an adorable pin cushion. I'm definitely going to make one! what a wonderful cute pincushion!! I think I have to run upstairs and make one of these right now!! Is this going to be another class? Such a sweet little cottage - I wonder who lives in a place like this? Fantastic tutorial. Must make one soon!! Oh gosh it couldnt be cuter! Es precioso!!! muchas gracias por el tutorial. Your little houses look like fun to make as well as being so adorable!! I have to make a pin cushion for a gift and just when I decide on an idea I get get tempted by another. Thanks so much for taking the time to write a tutorial!! It's funky and adorably cute at the same time. Thank you so much for sharing, Ilove it. Thank you for the pattern! I collect pin cushions and just love this one so I hope to get one made. Adorable! 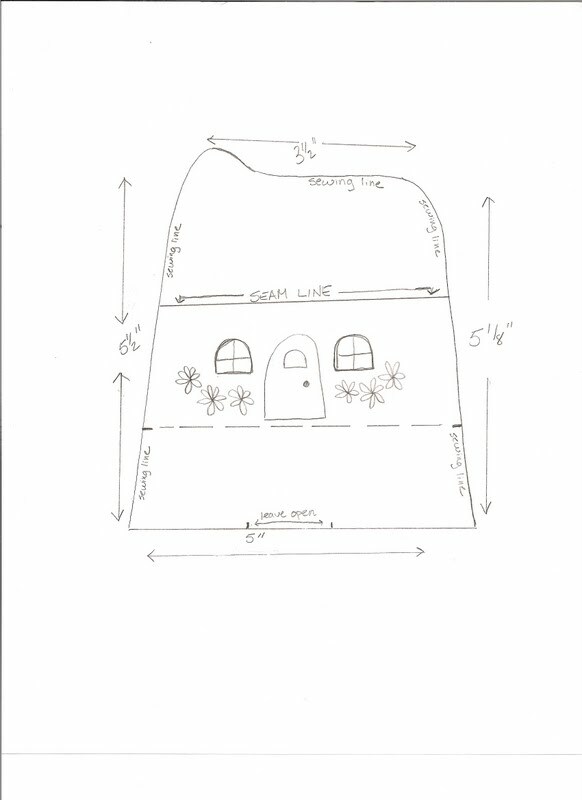 Very cute, once I saw your little house I had to stop what I was doing and make one. Thanks for posting the tutorial. I've loved this little pin cushion from the first time you posted it! It's absolutely darling!!! A friend sent me to this post. This is absolutely adorable! I've finally made one - although it's little and dumpy as I adapted to fit some scraps!